Moorestown, N.J. - Weiler Labeling Systems (WLS), powered by ProMach, introduces their new stand-alone high-speed LC-100 label coder and LP-100 label printer at the Healthcare Packaging Expo in Las Vegas, September 25-27. Between the two models, WLS offers thermal transfer, laser or drop-on-demand printing for coding, serializing and/or print-on-demand applications providing the quality, productivity, and security required in the healthcare industry. (Weiler displays the LC-100 at Healthcare Packaging Expo Booth #N-309, and Booth #N-307 features the LP-100). 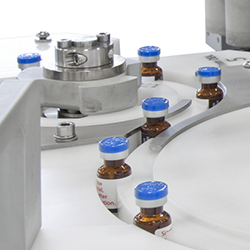 The LC-100 and LP-100 are ideal for manufacturers and contract packagers of over the counter (OTC) and regulated pharmaceuticals, nutraceuticals, and medical devices as well as biotech products and more. Coding labels offline with the LC-100 enables users to supply coded and/or serialized labels to run on existing labelers, which minimizes changes to the labeling operation to simplify validation and keep packaging lines running at peak efficiency. The LC-100 being displayed highlights Optel's Label Tracker serialization solution along with Domino's D320i laser. The continuous-motion, servo-driven LC-100 prints variable data onto pressure-sensitive labels at speeds up to 3,000 inches per minute, allowing one unit to supply labels to multiple labelers. 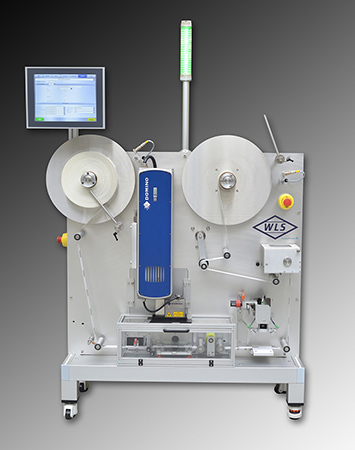 As a fully stand-alone unit, the LC-100 unwinds, prints, inspects (if needed) and rewinds labels. It is capable of maintaining a print placement accuracy of +/- 0.020 inches (0.5 mm), depending on the print specifications and label material. In addition, an optional Interceptor is available, which automatically removes rejected labels from the roll. 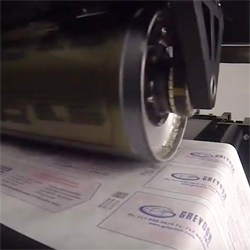 The LP-100 features a UV-curing drop-on-demand (DOD) printer from Greydon, another ProMach company, that can print high resolution line barcodes, serialized 2D data matrix barcodes and human readable codes, as well as the full label including high-impact visual graphics in full color or black-and-white at speeds up to 7,500 inches per minute. It offers superior print quality and print wear resistance on most substrates without the need for special coatings or pre-printed areas. The LP-100 enables customers to digitally print on demand and thereby reduce the number of different labels held in inventory. 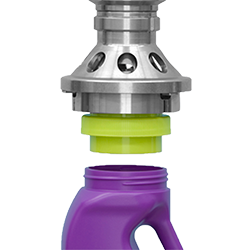 As with the LC-100, an optional Interceptor is available, which automatically removes rejected labels from the roll. 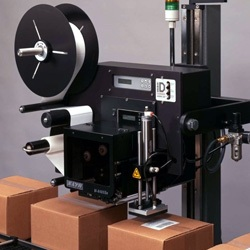 The LC-100 and LP-100 both handle a label roll size up to 18 inches (457 mm) in diameter with a 3-inch (76 mm) diameter core. Print changes are quickly made via recipe downloads on the color touchscreen control panel. Label styles can be changed in less than 5 minutes with no tools required and no change parts. Low level, end-of-web and broken web detection can be programmed to flash a light and/or send an alarm to operators. The HMI is password protected with multiple levels of access to help secure the operation. Equipped with Ethernet ports, the LC-100 and LP-100 can be connected to plantwide networks to collect data for reporting purposes and enable remote diagnostics. These compact units feature a balcony-style structure including an integrated electrical enclosure. Their construction is conducive to the demands and requirements of pharmaceutical and medical device manufacturers. WLS supports the LC-100 and LP-100 with an industry-leading warranty and world-class technical service.